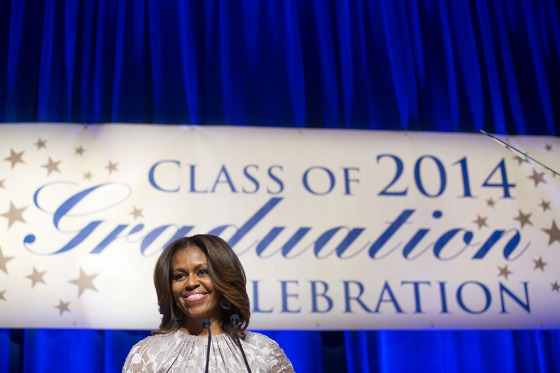 First Lady Michelle Obama told graduates at the District of Columbia College Access Program that they may have struggled to get through school, but they have expanded their capacity to handle life’s challenges. WASHINGTON — Drawing from her own experience as a first-generation college student, first lady Michelle Obama encouraged several hundred graduates here to embrace struggle as a means of personal growth. “Don’t ever, ever shy away from a good struggle,” the first lady said at a recent graduation ceremony for the District of Columbia College Access Program, more commonly known as DC-CAP, which provides counseling and scholarship aid to district students. “Instead, I want you to seek it out and dive in head first, because that’s what truly successful people do,” she said, citing her husband Barack Obama’s rise to the White House as an example. The first lady told the students that though they may have struggled to get through school, they had grown smarter as a result. “Science actually shows that when you’re struggling to solve a problem or to understand a concept, you’re forming new pathways and connections in your brain,” Obama said. “So struggling isn’t a bad thing. Obama made her remarks Thursday to high school and college graduates from the Class of 2014 who received support from DC-CAP. Among other things, the program — which has been credited with boosting high school graduation and college completion rates for district students — provides counseling and “Last Dollar Awards” of up to $2,070 to district public and public charter school graduates who enroll in an accredited postsecondary institution. Michelle Obama told the graduates that she faced similar circumstances as them growing up and in college. Rather than give up, Obama said, she worked harder to make a favorable impression. Ultimately, she said, when she applied to law school and got accepted at several but “waitlisted” at Harvard, the professor volunteered to write another letter of recommendation. Similarly, she told the students they should never give up when faced with doubters. She also encouraged the students to avoid family matters that sidetrack their goals. She credited her own parents with not burdening her with their own problems when she was in school. “They knew that I had enough stress in my life on my own, and they were determined not to add any more stress from their lives,” Obama said. Consequently, she said, she was able to focus on getting good grades and a good job. Obama encouraged the students to serve as role models and mentors for students from similar circumstances. She also touted her Reach Higher initiative to increase college attainment. “I will be doing this work not just for the rest of my time as first lady, but for the rest of my life,” Obama said. The first lady’s speech resonated with students such as Devylle Campbell, 22, a graduate of the University of Maryland Eastern Shore who said she plans to go into teaching. “Oh my God, it was the perfect speech,” Campbell said. “She hit all the key points,” Campbell said, recalling her own struggles not to be sidetracked by relatives or friends who were not in college. Joshua Grant, 23, a graduate of Elizabeth City State University, said he appreciated Obama’s encouragement to embrace new challenges. “Just because you graduate don’t make life sweet,” said Grant, who said he hopes to work in radio. Grant credited the DC-CAP program with helping him get through school. Although he graduated with debt, he said, that debt is about $10,000 less than it would otherwise be thanks to DC-CAP.